We Say Goodbye to Friends | Sprezzatura, Y'all! We have just about two weeks left in Anghiari. We’ve started saying our goodbyes. And as with most things Italian, they involve food. We had dinner with Rosella and Michelangelo a couple of nights ago. Michelangelo is leaving in few days for the U.S. on business and he flies back into Rome the exact day that we fly out of Rome. The timing doesn’t work out to see him at the airport, but what irony. We met them in Citta di Castello and walked around town on a very cold evening. Citta di Castello is a beautiful medieval town, with plenty of shops and restaurants. It’s a good-sized town with a lot of young people, so there are also a lot of bars that have happy hour. You only see that in the bigger cities – certainly not in Anghiari. Happy hour here involves paying a little more than usual for a drink (say 4 euro instead of 2), and then having a buffet with lots of food. It’s how most young people on budgets eat dinner. Citta di Castello, literally City of the Castle, dates back to 550. Rosella can tell you the history of every part of the town. She’s lived around there her entire life. The castle, now part of the city complex, has a wide, shallow staircase that leads from the ground level up to the living quarters above. The stairs were used for the royalty to ride their horses up, then the servants would bring them back down. That’s why the stairs are built the way they are, to make it easy for the horses to go up and down. On the outside of the castle is an iron basket, just by the front door, that was used to display the severed heads of the unfortunates who either committed a crime or crossed the royal family. Also along the front are the iron holders for the torches and the hitches for the horses. Ah, the good old days. Citta di Castello is not unlike any old town here – there’s always a layer underneath that no one knew about. We were walking by a facade of an old building that had thin air on the other side. They explained that someone was planning to build a condo development there (how American does that sound? ), but when they started excavating they found old Roman ruins. Sure enough, we walked around to the other side and there were the remains of something very old. This had obviously happened a while ago because the ruins were all grown over with weeds and grass. Now that they have found it, what should they do with it? It’s caused a great debate among people who say there should be no new development and some who say that new development is needed. Sound familiar? Our debates don’t involve Roman ruins, but the fundamental principle is the same. We had dinner at Il Fiorentino, which is known for Umbrian specialties and steak. We shared an antipasto platter of meats, bruschetta, and cheeses. I love this. It’s so simple, but so wonderful. It’s all about the quality of the products. And it always seems like such a good idea, but it always fills me up. I hate to make this comparison, but it’s the chips and salsa at a Mexican restaurant. I can’t help myself and I can’t stop eating them, but they fill me up so much that I never can finish my food. But I was a trooper and managed to have a plate of pasta after that. I had the tortelli d’anatra, one of the house specialties. 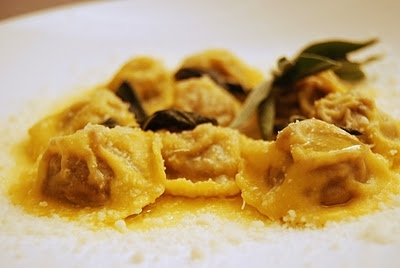 Tortelli is a filled pasta, and this one was filled with duck (anatra). I can’t tell you how good it was. I’m sure there were many other things in there besides duck, but the flavor was incredible. I’m ashamed to say I didn’t take a single picture at dinner. Maybe it was because it was a bit melancholy since it was a farewell dinner. I pulled a picture off the internet to show you what it looked like. This was very similar to what mine looked like before I gobbled them down. As we finished our dinner and made our way back to our cars, we decided to have one more dinner. We just weren’t ready to have this be this the end. So we’re going to their house for one more dinner, one more night spent solving the world’s problems, one more night together in Italy with friends. The next day our friends Ludo and Sonja, their two children and Sonja’s mother came to Anghiari for lunch. They live in Perugia, which is about 45 minutes away. We’ve only seen them a few times since we’ve been here and, of course, while we were with them we wondered why we didn’t see them more often. Now that we were down to the last time, it seemed wrong that we hadn’t been able to get together more. But with two young children (4 years and 18 months) and Ludo owning his own food export company, and them visiting family, and the holidays, and us having company and traveling around, it was more difficult than we thought it would be. But it was so good to see them one last time. We had lunch downstairs at the Cantina del Granduca and it was, as always, very good. Sorry no pictures of that meal either. Not sure why I’m not taking pictures of these special meals. Maybe subconsciously I think if I don’t document it on film, it isn’t really happening and it’s not really the last time. Anyway, after lunch we walked around Anghiari for a bit, then came back to our apartment to visit. Chloe, their 4-year-old, who is adorable, wanted to see the entire apartment. She went into every room and had a comment about each of them. She asked who slept in each of the bedrooms and which one I slept in. She seemed to have a hard time understanding that we had two bedrooms that no one used. They live in a very nice condo that has two bedrooms and one bathroom for four people, and now the visiting grandmother. I’m sure it must seem strange to her that we have two bedrooms and a bathroom that are empty. As we were walking them to their car and saying our goodbyes, we decided to have one more lunch with Ludo in Perugia this week. So our final dinner with Michelangelo and Rosella and our final lunch with Ludo weren’t so final after all. Maybe that’s the way it is with goodbyes. When we can’t quite let go, we try to lengthen our arms until our fingertips can’t meet anymore. Then it’s goodbye. Poignant Cathy, I feel like crying. What a beautiful description of saying goodbye, “we try to lengthen our arms until our fingertips can’t meet anymore”.